Gere, Richard — Pretty Woman star Richard Gere spoke out in an Australian Women’s magazine about the massively successful 1990 romantic comedy, calling the film “silly ” and taking jabs at it for misrepresenting bankers as “dashing, which was wrong.” Really, Richard Gere? In a film where a dashing banker meets a funny, adorable, virginal prostitute seeking true love, you guys got it wrong about bankers? Lamb, Brian — 70 year-old C-SPAN CEO Brian Lamb has announced that he will be stepping down from his role bringing America the goings-on in the depths of our government and take a smaller role as the network’s board of directors. We mention this because if Lamb announced this information on C-Span, there’s no way you were watching it. Or that it was interesting. Scratchy, Itchy and — Got forty-nine minutes to spare for something incredibly awesome? 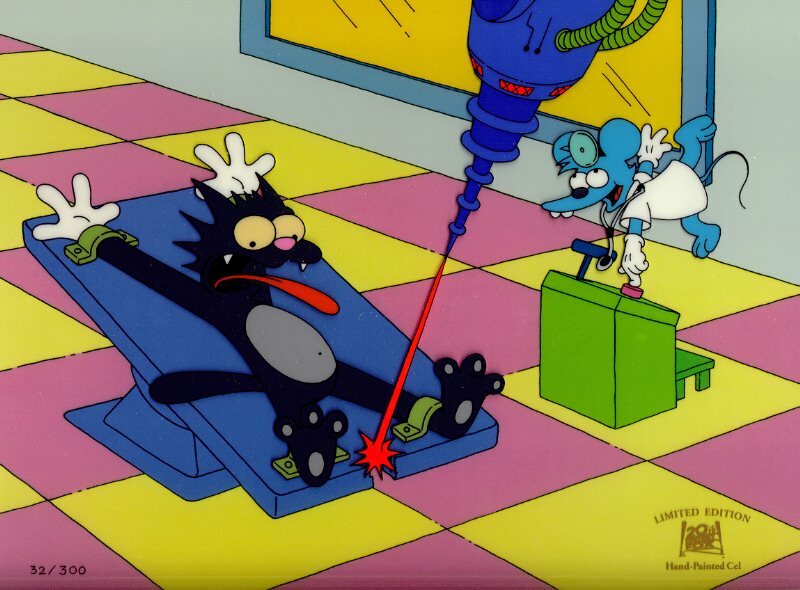 Then check out this gigantic, long youtube clip featuring every Itchy and Scratchy cartoon ever from the Simpsons‘ run. You’re welcome. Situation, The — Though TMZ reported earlier this week that Jersey Shore star Mike “The Situation” Sorrentino had checked into rehab for substance abuse, the Sitch’s reps are insisting that the Popeye-esque reality star is just really tired. According to his people, Sorrentino “has spent the past several weeks at an undisclosed location for much needed rest and recuperation after his extensive production and appearance schedule.” See? There’s nothing wrong, he just needed a nap for several weeks at a secret napping spot! Move on, America! What, you’ve never been tired before? Times, High — In absolutely shocking — shocking! — news, a senior writer for marijuana-hyping High Times magazine has been arrested as a mastermind behind one of Manhattan’s largest and oldest pot trafficking rings. If this news truly surprises you, feel free to go back to telling yourself that all the vehement “hemp enthusiasts” you know are just really, really actually interested in how to make rope. Turtles, Teenage Mutant Ninja — As Michael Bay (who never gets anything wrong) works on another live-action adaptation of the 80’s icons Teenage Mutant Ninja Turtles, he tells Screen Rant that he’s taking some liberties by changing the heroes’ origin story to make them an “alien race.” Now, fanboys, take a deep breath. Before you get really, really upset about any changes to this mythology, I want you to step back and think about how it’s going to look to get bent out of shape, at 37 years old, about the Teenage Mutant Ninja Turtles’ origin story. I’m only trying to help you here, okay?